Big Day For USA Soccer: Will You Be Watching? The World Cup has begun, but is America ready for USA vs. England today? On any given Saturday, Americans are constantly running errands, spending quality time with their families, as well as unwinding from the long workweek. Although, today is something special, it is USA vs. England in a highly anticipated soccer match. It has been roughly 60-years since these two allied nations played against one another on a gigantic stage like the World Cup, but who really will be caring today about this specific contest? Will you be crying your eyes out if America loses? Does this specific game mean so much to you? Here in America it seems from my vantage point that sports fans gets revved up for college football on Saturday’s, NFL on Sunday’s, along with baseball, basketball and hockey throughout the week, but not soccer. Do you know anyone that becomes incredibly needy for MLS or European soccer? I don’t, but I do know there are a decent amount of soccer fans across this nation that already have World Cup fever. Today, I will watch team USA begin their quest in possibly capturing their first World Cup trophy, but I am not optimistic about their chances or the possibility of them beating England, Brazil or other top soccer nations. Seriously, does anyone in America believe they have a chance? What do you think President Obama has to say about his country in the World Cup? I know during the winter Olympics in February, I believed both the men’s and women’s USA hockey squads had an incredibly slim chance of winning. I thought this because Canada, Russia and Sweden were going to be too powerful, but instead, both squads made it to the medal round and returned home with silver medals in their hands. So how do I gauge this entire USA soccer team? Do I just assume that they will do poorly too? Will they surprise America just like both hockey teams did in Vancouver? Again, soccer has never been the sport that most Americans get so amped about because it is not our pastime. Besides, I still have images of the 2006 World Cup on my mind when Italy’s Daniele De Rossi elbowed Brian McBride in the face. Coach Bradley has a great deal of pressure to win! 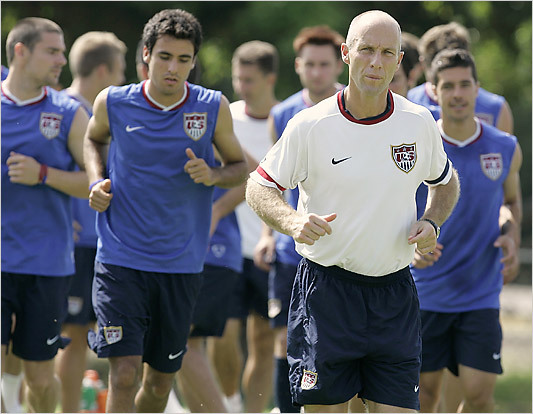 Supposedly Coach Bob Bradley has a team that is committed to excellence and winning. I won’t buy into any of that until USA exits its current Group C and defeats at least England, Slovenia or Algeria. I think England will be the toughest opponent, but how can USA not defeat Slovenia or Algeria? To be honest, after all this rage of excitement of writing my thoughts pertaining toward the World Cup, primarily focusing on team USA, maybe I am excited to watch some soccer for the next few weeks. Uh oh! I think I am catching World Cup fever too!